Otakon 2011, inside the Hilton lobby. Brief costume description on the gallery. : ) He does like pets. That is so cool! (Your dog is so sweet and cute). Thanks. He's an awesome dog. Thats really awesome and very creative. 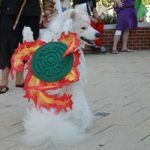 It would be cool if we can use more pets with our cosplays ^^ ur dog is just simply gorgeous. Thanks. He's really happy to be the center of attention, so he's great for that sort of thing. Thanks! Yeah, we only went out three times for about half an hour each - we didn't want the pup to get overwhelmed or overheated. 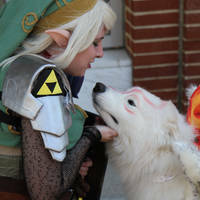 ah, well i'm glad you cared about the dog more than the cosplay ^^. i hope he enjoyed the con too! Just a question, was it hard to get the markings on him/her? Harder to do neatly with thicker fur, which is why I only did the head, not the sides. Maybe I'll do the sides on another outing. Once it dried, it actually resisted smudging pretty well. I didn't know they had food colouring markers. The more you know, 'ey? Ooo~ I'll be waiting for when you do. I can only imagine it'd be harder with a cat. Wouldn't know, I'm not game enough to try, Ha ha! Cool, I didn't know that. Thanks! Your dog is really beautiful... Is she a samoyed? Perfect cosplay for her btw. Yep, he is. It's a crossplay, but he's so furry, you can't tell. I really want to adopt a Samoyed later when I have a garden, I love them. I think Amaterasu must be a Akita but a male Samoyed can be nice too, the bodies are quite alike. Yeah, they're great dogs. Akitas have more wolfy fur, so probably, yeah. The main issue with both is the curly tail (especially for samoyeds - it looks like a pom pom). I'm going to try to teach Dante to drop his on command, so he looks more like a wolf. Id love to see more pictures with the dog <3 Please do more! I have some more from the con; will post when I get a chance to sort through them. He's a samoyed, a year and a half old. i'm surprised that its okay with the costume parts on it. He's surprisingly tolerant, so long as he's being given attention/played with. The only time he gave any trouble was when he caught one of the wings out of the corner of his eye, and viciously attacked it. It was pretty cute; I wish I had a clip of it. that is surprising that he lets you dress him up though. did you even have to train him at all? Not specifically for this, but we did do a bunch of training. Samoyeds are pretty hard to train - they're willful and care more about playing with people and dogs than about food. Fortunately, he doesn't have any meanness about him at all, so we don't have to worry about him attacking... just about him getting overexcited and jumping on people.